There are three Sandals Resorts in St. Lucia, which some consider the best island in the Caribbean for couples. Where else can you view the beach and the mountains together in a heart-soaring panorama of beauty? Couples can choose between Sandals Regency La Toc (the largest and hilliest), Sandals Halcyon Beach (the smallest), and Sandals Grande St. Lucian. While all have their fans and attributes, Sandals Grande St. Lucian has the nicest beach of the three and also is the only one with overwater bungalows. This all-inclusive resort is set on a peninsula, surrounded by the Caribbean Sea on one side and the Atlantic Ocean on the other. 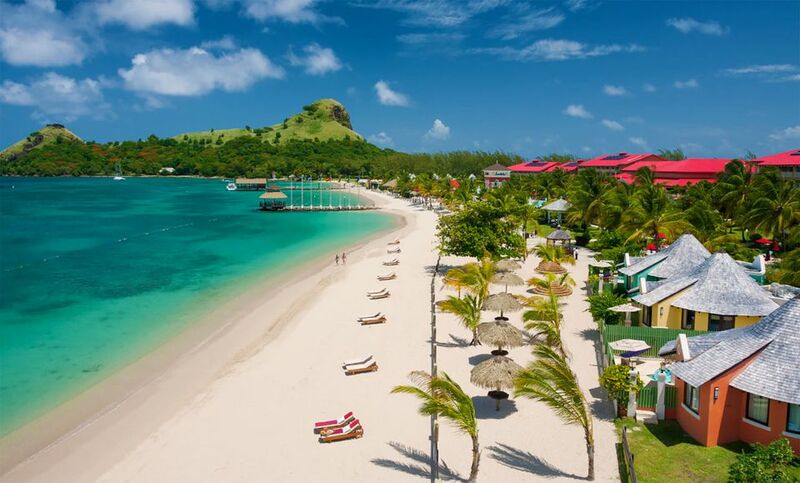 Beachfront Sandals Grande St. Lucian features almost every land and sea amenity a couple could want. It's also where Prince Harry spent two days in Saint Lucia, the third stop on a tour of seven Caribbean nations with historic links to the English monarchy. An appealing aspect of the Grande St. Lucian is the "Stay at 1, Play at 3" feature, which allows couples to visit the other two Sandals properties on the island. Free shuttles travel to and from the other resorts every hour on the hour until midnight, and additional ones go during dinner hours. All the resorts are about an hour and a half drive from the airport, where Sandals maintains a private lounge for guests, complete with complimentary snacks and cool beverages. Many of the rooms and suites at Sandals Grande St. Lucian overlook the Caribbean Sea, a soothing and romantic view. If an overwater bungalow is a bit too expensive, consider a mid-priced Caribbean Beachview Club Level room on the third floor. Although it's in the middle of everything, the room is so quiet and serene it will feel as if you're the only ones around. If you prefer having direct access to the water, select a Swim Up Lover's Lagoon unit or a Rondoval with a private pool instead. Built in the round, Rondovals are like a studio apartment where everything you need is at arm's length; and they have a bathtub that fits two. The Beachview Club Level room features a four-poster king-size canopy bed, big flat screen TV and balcony with a view. There's a love seat, coffee table, and desk in the room with a coffee maker as well. After check-in, you'll be escorted to the room by a staff member who will acquaint you with the property. There are tours of the hotel daily at 8:30 a.m. and 5 p.m., a great way to become familiar with the resort. The mini-bar is stocked every day with cold sodas, juices, and bottled water. In a Club level room, beer and alcohol are provided, too. But since it’s an all-inclusive and drinks are readily available, you may decide to pass on the upgrade. The bathroom has two sinks (which makes getting ready for dinner easier), a bathtub (alas, just for one), and counter space to fit all your toiletries. Shampoo, conditioner, lotion, and aloe (which may be much needed after a day at the beach) are provided from the Red Lane Spa. The balcony may be your favorite part of the room. It has two chairs with a table and a bird’s-eye view of the Caribbean, the big pool, and gardens. In the distance, you may see a small fishing village. The good news: No one will go hungry at Sandals. There are 12 restaurants at the Grande. The bad news: The food is mediocre. Bayside is an open-air buffet for breakfast and lunch that converts to an à la carte menu at dinner. Each day for lunch there's a different theme — one day it may be Asian-style food, the next perhaps Mexican food. For lunch, choose Barefoot By The Sea, where the tables are literally set in the sand. It serves nachos, burgers, even traditional Creole meals. Gordon's on the pier overlooking the water is touted as the resort's best, so you'll want to don your resort casual clothing. Guests (except those on the Concierge level) have to pay extra to eat here. The menu specializes in fish and seafood, but also has filet mignon and chicken. The service, presentation, and setting set this restaurant above the rest. If you're lucky, you'll see tropical fish as you dine — the staff shines lights into the water to attract them. Toscanini’s is an Italian-style bistro featuring an antipasto bar and Italian favorites such as lasagna, ravioli, and chicken parmesan. You will either love or hate Kimono's, where guests are seated around a grill and the chef shows off his knife skills and cracks jokes as he cooks. On Monday nights, most of the restaurants close down for the Beach Party, an endless buffet right on the sand with games and dancing. Room service is available but only for guests staying at the Concierge level. There's more than one spot for a destination wedding at Sandals Grande St. Lucian. The newest is in the purpose-built chapel at the end of a row of overwater bungalows. Less private beach ceremonies can take place on the sand in a pristine spot with a modest altar and amazing backdrop of the Caribbean Sea and the mountains. If you book a Sandals wedding package, you'll be assigned a personal wedding consultant. Couples who book a stay for three nights or longer can get a free wedding that includes a location, bouquet, boutonniere, two-tier wedding cake, and more. For a price, Sandals can also arrange more elaborate weddings that feature more amenities and accommodate larger guest lists. Newlyweds also receive breakfast in bed with mimosas, romantic turndown service with flower petals on the first evening of your honeymoon, and dinner with white-glove service in a specialty restaurant. The great thing about the Grande is that there are many activities as well as plenty of places where you can be alone. The main pool is near the beach, so if you choose a spot between them you'll have easy access to both. Couples who want a cabana (a hut in the shade with two lounge chairs) usually have to get up fairly early to grab one of those. There's a hot tub by the main pool and also a swim-up bar. The main pool area plays reggae and island music and there are announcements of games and entertainment during the day. There is a smaller pool off to the side. Other pools are quiet spots. There are four hot tubs as well. Golf at the Regency course is included as an amenity; caddy and greens fees are extra. Although there's an indoor gym, you may be more tempted to participate in activities outside. Most take place on the beach: volleyball, table tennis, games. In and on the water there’s water skiing, Hobie cats, water bikes, kayaks, snorkeling, windsurfing. Couples who want to rent jet skis deal with private vendors unaffiliated with Sandals. Red Lane Spa services and treatments are not part of the all-inclusive price. Yet you still may find a 50-minute couple’s massage worth it; the experience is intimate and relaxing, thanks to the lighting, the flowers, and the serene background music. In the evenings, challenge your spouse to a game of billiards. The resort also has events such as a talent show open to staff and guests, live bands, and karaoke. And you can stop by the Grande's piano bar after dinner and sing along with other guests. Sandals Grande organizes off-site excursions for a fee. These include adventure cruises around St. Lucia, tours of the Pitons, dolphin and whale watching, horseback riding, zip-lining adventures through the rainforest, Jeep tours, and booze cruises. Feeling adventurous? Sign up for the zip-lining tour. The rainforest is about an hour's drive away. Your tour guide will point out landmarks and perhaps stop to pick a fresh coconut and offer you a try. In the rainforest, you'll be equipped with essential gear (helmets, harness, gloves, etc.) and directed to walk up stairs to a balcony for the first of 11 zip lines. Soaring above the trees provides a spectacular view of the rainforest. You should also consider taking a tour on a speedboat. It includes snorkeling between the Pitons, visiting the historic town of Soufriere, a dip in mineral pools, and a walk through the volcano. Pigeon Island, a national landmark that covers 40 acres, is within walking distance of the Grande. In the 18th century, it served as a British fort. As you hike up (after paying an entrance fee), you’ll see ruins from the days of battle. It’s a strenuous climb, but worth the scenic views of Rodney Bay and the Atlantic Ocean. The resort attracts a crowd between 20-40. And it is definitely a place for couples; children are not permitted at Sandals. What is impressive about the resort is there is something for every type of couple. If you're looking to make friends, you're certain to encounter others who are happy to meet new people. If you're looking for a party vacation, there is always something to do at night, such as the club and bars. Or if you're looking for a romantic trip, just you and your partner, you can have privacy whenever you want. Before eating dinner, stroll around the property to catch the sunset and take memorable photos. Better transportation between the airport and hotel. Sandals offers free shuttle buses to and from the airport, but it takes an hour and a half each way. There is only one main road. St. Lucian drivers are aggressive, and the windy and mountainous lanes create a bumpy ride. Couples can also opt to take a helicopter ride to an airport a bit closer to the resort, but it is expensive. More casual restaurants at night. Although most of the restaurants ask guests to don resort casual attire, it would be great if there were one to go to at night in bathing suits to continue to spend the day and evening by the water. Room service for all. It would be great to have room service available for every room level, but it is only available to Concierge level rooms. Still, there's a reason Sandals Resorts attracts honeymoon couples year after year. Thanks to locations beside great beaches, well-appointed rooms and suites, and plenty to do on site and off, love is always in the air.